This species is widespread and stable or expanding in most areas in the United States. It can be found in the Mississippi River drainage from Nebraska east to Iowa, Illinois, and Ohio, south to Louisiana, as well as in the Mississippi River, Wisconsin, and Escambia River system, Alabama. Comments: Relative to other mussels, the flat floater is a short-lived species (8-12 years). Its thin, yellowish-green shell is smooth, shiny and nearly circular. There are no interlocking teeth to help hold its two valves together. 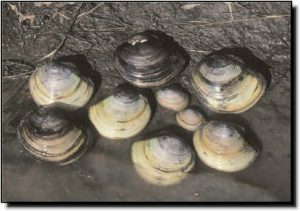 This mussel prefers the soft mud of oxbow lakes and ponds occasionally flooded by the Neosho and Marais des Cygnes rivers. In late winter a female releases mucous strands laced with glochidia. When a fish swims through this “web,” some of the glochidia clamp down on the fish’s fins. 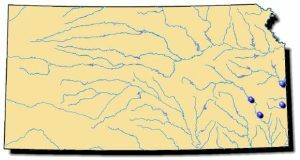 If the fish is a suitable host and a spring flood occurs, the fish will carry these “hitchhikers” to invade other oxbow habitats where they drop off and grow.